Great to have the lads back at Scotlands Longest Running Rock Club for a night of Rock and Roll. 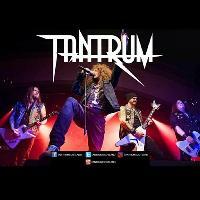 Formed in 2016, Tantrum settled on the current lineup and set about bringing traditional British heavy metal back to a public force fed on a diet of sanitised radio rock! Staunch believers in the old gods of metal, Tantrum blend hard hitting machine gun drums and pulsating, heart beating bass with screaming twin lead guitars and acrobatic vocal histrionics, all firing together to create anthemic metal crowd pleasers you'll be singing for days! Free to Gold Vips / Discounts available for Silver Card Vips. Rock Club action till 3am after the live session wraps up ALL for the cost of a ticket !! I know its insane.